Hooked On The American Dream: The Oregonian-Teen Bomb Suspect Thought It Was A Sin To Live In U.S. The Oregonian-Teen Bomb Suspect Thought It Was A Sin To Live In U.S.
Mohamed Osman Mohamud was angry at his parents for keeping him from jihad and had thought about carrying out an operation, "something like Mumbai," since he was 17. On the two-year anniversary of the shooting and bombing attack on a Mumbai, India, hotel that killed 166 people, Mohamud pressed the buttons on a cell phone he thought would trigger an explosion, creating a "spectacular show" and killing hundreds at Pioneer Courthouse Square, the government alleges. Mohamud is accused of the federal crime of attempted use of a weapon of mass destruction. If convicted, he faces a maximum sentence of life in prison, according to the U.S. Department of Justice. 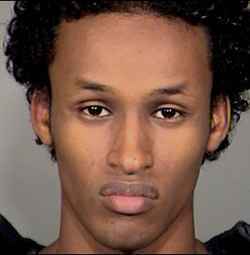 Mohamud, 19, was arrested late Friday afternoon after a lengthy investigation and undercover sting conducted by the FBI and Oregon law enforcement officials. He will be arraigned at 9 a.m. before the federal magistrate assigned this month to handle arraignments, officials said.